Services of the newly formed congregation were held in the Methodist Church until November 1879, when the congregation moved to the Griggs and McCormack Hall. The "Ladies' Aid Society", which later became Presbyterian Women, actually predates the organization of the church, as it was organized in June, 1878 at the home of Mrs. Valeria V. Freeman, on the farm now known as Lincoln Park. Colonel Frank Viets, a trustee, presented land to the congregation at the corner of Belmont Road and Fifth Street; ground was broken in 1880 and the building was first used in June 1880. By the fall, the church was bricked up on the outside and pews were installed to replace the boards which had formerly served as seats. The building was not dedicated, however, until January 25, 1885, at which time the debt had been retired. The bell, which has hung in each of the congregation's buildings, was presented by Mr. H. R. Bishop of New York City, who had visited Grand Forks in the summer of 1880. The bell was cast by the Clinton H. Meneely Bell Company, Troy, N. Y. Education has always been an important part of the church's mission. 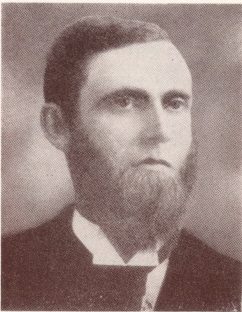 Although no record remains of when the first education classes were formed, records show W. A. Gordon made the first report of the Sunday School to the congregational meeting April 4, 1888. A John M. Smith, however, reportedly recalled that in 1880, the mercury stood at 32 degrees below zero, there were 32 pupils present, and the offering amounted to 32 cents! 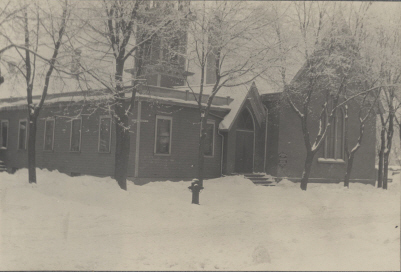 On March 5, 1911, the last services were held in the original building. Don McDonald, a pioneer member of the congregation spoke about the early days of the church during the farewell service. In the address, as reported in the Grand Forks Herald on March 7, 1911, Mr. McDonald said the first pastor, F. W. Iddings (photo, left) "would not perhaps take high rank as a preacher, but was a sincere Christian man, fearless in expression of opinion and even in the early days took strong ground on all public questions. He had the respect of the entire community. In 1881, owing to throat trouble reluctantly gave up the charge and has never resumed work in the ministry." On May 7, 1911 the cornerstone of the new building was laid on the same plot as the original building. This building, designed by Joseph Bell DeRemer, an elder of the church and later one of the architects for the North Dakota State Capitol, was dedicated March 3, 1912. In December 1970, the Worship Committee, chaired by Dr. Russell Wilson, chose the Aeolian-Skinner Organ Company of Boston, Massachusetts to build a new instrument for the congregation. The organ was delivered in the spring and summer months of 1972. During its building and installation, the Aeolian-Skinner firm, certainly the most significant organ building shop of its kind in the United States during the twentieth century, succumbed to bankruptcy. First Presbyterian's Aeolian-Skinner is the last completed organ in a line of remarkable instruments including those at Grace Cathedral, San Francisco; Bruton Parish Church, Williamsburg; the National Cathedral, Washington D. C.; and the Riverside church, New York. The organ has three manual keyboards, one pedal keyboard, 33 sounding stops, 46 ranks of pipes and 2,456 individual pipes, which were all moved to the current building. The 1911 building was home to the congregation until April 1997, when it sustained extensive damage during the major flooding that devastated Grand Forks. A farewell service was conducted there in September 1997, with bagpipers escorting the congregation out of the building. While "homeless", the congregation held services at the Memorial Union and Hughes Fine Arts Center at the University of North Dakota. After making the difficult decision to sell the building at Belmont Road and Fifth Street, the congregation hired YHR Partners of Fargo to design the building at 5555 South Washington. The core building, including the sanctuary, Great Room and kitchen, was dedicated September 26, 1999, with the same bagpipers escorting the congregation into the new building. A classroom extension was added in 2002. On February 12, 2012, Ken Dawes spoke to First Presbyterian on the history of Grand Forks churches. Copyright © 2010 - 2012, First Presbyterian Church Grand Forks. All Right Reserved.